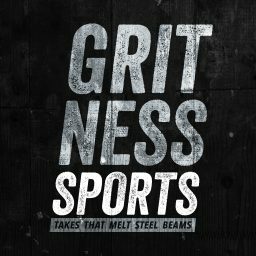 For the Bills’ first playoff game since Eli Whitney was toying with the cotton gin, the Gritness Sports team and some close friends decided to make the 17 hour drive down from Buffalo to Jacksonville. To commemorate the occasion, I thought I’d share some pictures from my earliest days as a Bills fan. Its amazing how far we’ve come since the early days, but I have to give credit to my mom for embracing my fandom and nurturing it by taking me to the Kids’ Day Games every preseason. She also bought me my first jersey, Drew Bledsoe, which I still rock once in a while to this day. Check out that form, the backwards visor, and the wide pants. What a fashion icon. The people that made me this way, my mom (on the left in the dope Bills sweater) with my Aunt Carolyn and my Dad with my Grandpa probably milking cows or something before the game starts. Here’s to making more memories and getting the Bills’ first playoff win in 21 years!